L-R: Commissioner for Infrastructure, Hon. Osahon Amiolemen; Chairman, First Bank of Nigeria, Mrs. Ibukun Awosika; Chief of Staff to Edo State Governor, Chief Taiwo Akerele; Commissioner for Women Affairs and Social Development, Hon. Magdalene Ohenhen; and Senior Special Assistant to the Governor on Job Creation and Skills Development/Head, EdoJobs, Mrs. Dare Ukinebo, during a two-day workshop for entrepreneurs and small and medium enterprises (SMEs) in Benin City, Edo State. 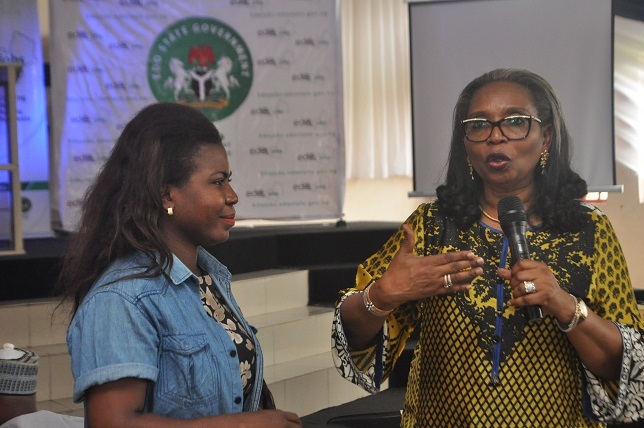 Chairman, First Bank of Nigeria, Mrs. Ibukun Awosika (right); with a participant, while making her presentation at a two-day workshop for entrepreneurs and small and medium enterprises (SMEs) in Benin City, Edo State.